Canonical, the company behind the Ubuntu Linux operating system, has announced a new version of Ubuntu designed specifically for smartphones. Ubuntu for phones is based on the Linux kernel and uses the same Unity user interface that Canonical has developed for the desktop, which the company says should make it immediately familiar to anyone who has used Ubuntu before. "What is remarkable about the Ubuntu phone interface is the extent to which it is instantly recognisable as Ubuntu in terms of how everything looks and works, yet it is perfectly designed for its form factor," Canonical CEO Jane Silber said in a blog post announcing the OS. Because it uses the same device drivers as Android, Ubuntu for phones will be able to run on a wide variety of hardware, ranging from entry-level devices with single-core processors to advanced "superphones" based on multi-core ARM and Intel chips. "In short, if you already make handsets that run Android, the work needed to adopt Ubuntu will be trivial," Canonical says. What sets Ubuntu apart from other smartphone platforms, however, is that it recognizes how much computing power is available on modern smartphones and puts it to use. 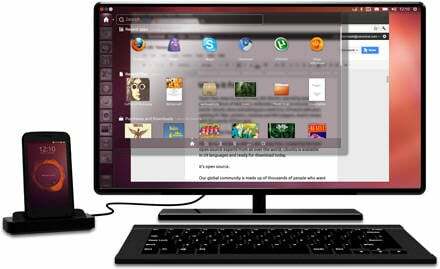 When an Ubuntu smartphone is docked with a keyboard and monitor, it becomes a general-purpose PC that can run the full range of desktop applications. A docked Ubuntu phone can even act as a thin client for Remote Desktop applications, allowing users to stream Windows apps from corporate data centers. Because of this versatility, Canonical envisions enterprises distributing Ubuntu smartphones as their primary secure-computing devices, replacing current phones, thin clients, and laptops. Ubuntu should also be attractive to the mobile industry, Canonical says, because its hybrid desktop/phone approach will be a driver for the latest mobile technologies, including high-end multicore processors and LTE data networking. Developers will be able to create applications for Ubuntu phones using either HTML5 or native code. Unlike some other smartphone platforms, including Android, Ubuntu does not include a Java virtual machine, which Canonical says reduces overhead and allows the OS to deliver good performance even on low-end hardware. Because Ubuntu for phones is based on the same core OS as Ubuntu for the desktop, however, developers will be able to use the Ubuntu SDK to build native applications that run across phones and desktops alike, with only minor UI changes for different device form factors. Canonical says it will handle all security updates and critical bug fixes for the base Ubuntu platform, and it will also provide infrastructure for device and carrier partners to deliver their own updates. The new OS will also be backed by Canonical's Ubuntu One cloud service. Device owners will start out with a certain amount of free storage in Canonical's cloud and will be able to pay to get more, while developers will be able to access APIs to store any kind of application data on Canonical's servers. The company says to expect the first Ubuntu phones to ship in the fourth quarter of 2013, and interested parties can register to hear when they become available. Canonical will also offer a sneak peek at the OS at the CES conference in Las Vegas next week, and at February's Mobile World Congress in Barcelona. Although Ubuntu has proven popular among desktop Linux users and developers, however, the announcement of Ubuntu for phones sees Canonical entering an increasingly crowded field. Currently, Android and iOS dominate the smartphone market, with a number of smaller players squabbling for third place. Microsoft is widely believed to have a good shot at developing a third major smartphone ecosystem with Windows Phone 8, but both the Mozilla Foundation and Research in Motion are also planning to launch new phone platforms in 2013, and another group is even working to revive HP's moribund webOS. Given so much competition, Canonical will have its work cut out for it if it hopes to transition Ubuntu into a successful smartphone OS. Even among Ubuntu's core base, opinion on the Unity UI has been divided, and some users have jumped ship to other Linux distributions over Canonical's more controversial fundraising efforts.